The Original Home with a Dome! 4BR/2BA Rustic luxury with amazing views! 4 BR, 2 BA + a unique Dome. Luxury home + rustic, outdoor living. Experience Joshua Tree in style-- stay at the premiere JT vacation rental! Completely renovated, inside and out, with a unique Dome Tent for luxury glamping under the stars. 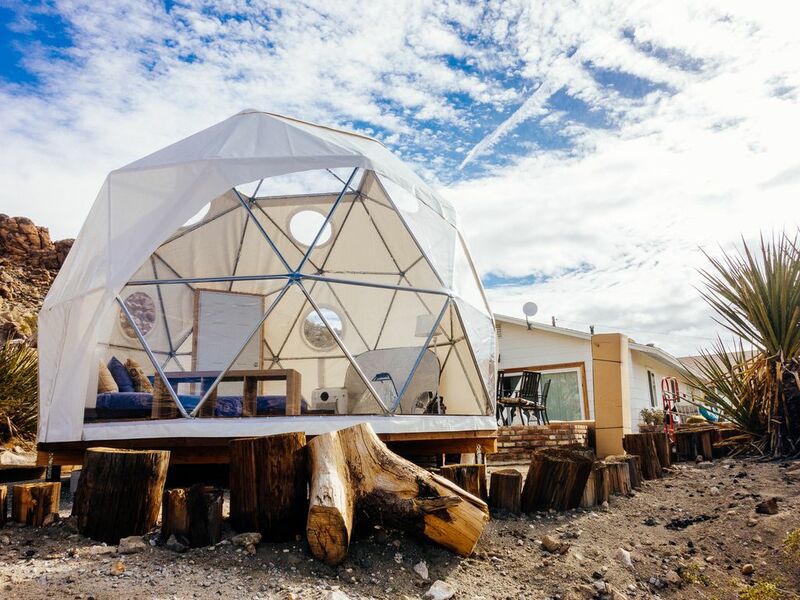 Have the best of both worlds: a luxury home with hotel-style amenities AND rustic, outdoor living, with camping in a dome! Everything you could want in a vacation rental is here, even things that you didn't know you wanted! * 7.5 acres of rocks: hike for hours without even leaving the property! * Secret concrete platform built up on a mountain of rocks! Overlooks the entire valley and enough space for a picnic, morning yoga session, or just sit back, relax, and enjoy the sunset. * Unique home can sleep up to 16 people in beds (including sofa beds and an air mattress), but the home feels cozy enough for just two people to enjoy as the large bonus bedroom has been repurposed as a music/art/yoga room. * Great location, only one mile from the West entrance to the park! We fell in love with this place the moment we saw it and so will you! It's so quiet and peaceful and the lovely views change as the sun moves across the sky. We never tire of visiting and we hope you won't either. A telephone with free long distance calling in the US is located next to the front door. Electric fireplace, provides heat and ambiance. WIFI is provided at the Desert House. AT&T and Verizon cell phones work. Yoga and Pilates area, yoga mats provided. All the basics, including condiments and spices. Seats 8 comfortably with room for a few extra at the kitchen island. Additional outdoor dining options. 3 large LED televisions with DISH. Vintage-style phonograph with record collection. Bluetooth speaker / Karaoke machine in the Bonus room. Movie collection in the bookshelf. Rotating library of books (provided by guests -- take one, give one). Various board games are available at the house. Guitar, amp, and keyboard are in the bonus room for guests to use. In-ground hot tub and outdoor bar are located on the concrete platform toward the back of the house, before the Dome Tent. Bedroom 1: Cal king bed, Bedroom 2: Queen bed, Bedroom 3: Queen bed, Bedroom 4 (bonus room): Twin Day bed with twin trundle (twin x 2), Dome Tent: Queen bed, Additional: Sleeper sofa x 2 and a queen-size air mattress Bonus: Outdoor grass bed Horse setup includes a roomy corral with water (water buckets not provided) and easy access to miles of scenic riding trails and dirt roads perfect for exploring. Additional charges may apply for your horse or horses. Plenty of parking next to the corral for your horse trailer. We are located just one mile from West Entrance to Joshua Tree National Park and all it has to offer for hiking, rock climbing, biking, horseback riding and exploring. It is an easy drive to museums, golf, shopping, art galleries and even southern California's famous theme parks. Great local restaurants are nearby for a night out. We are only 45 minutes from Palm Springs and all it has to offer. The Desert House is an excellent vacation rental with something for everyone. Other Activities: rock climbing, hiking.